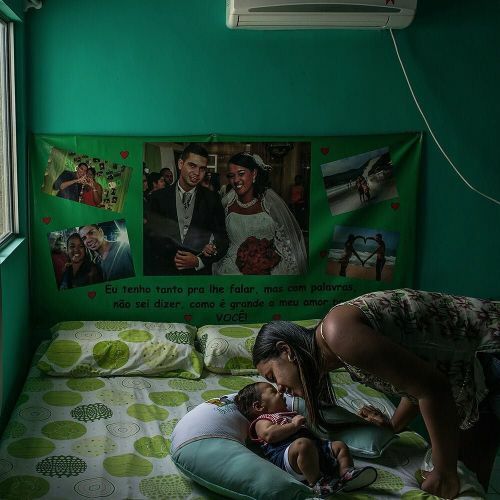 "Germana Soares and her 2-month-old son, Guilherme, at home in Ipojuca, Brazil, in January. Not long ago, Germana, 24, and her husband were young and relishing Brazil's version of the American dream: buying a car, joining a church, starting a family. "It was that magical moment when everything seemed possible," Germana said. Then, in the 6th month of her pregnancy, the couple discovered how quickly their fortunes, like those of their nation, could change. Guilherme was born with #microcephaly, and scans confirmed that he had brain damage. "I thought Hawaii would be wonderful to see," Germana said. "All those big plans are in the past. My priority has to be caring for my special boy." This #nytweekender, we're sharing photos by @limauricio, a freelance photographer who has been on #nytassignment documenting a trail of Zika-borne anguish in Brazil. #Zikavirus" By nytimes on Instagram.